A successful CRM program provides the platform that helps your organization continually improve and refine the way it acquires and services customers. The increasing competitiveness of the business world rewards organizations that understand their customers and that can react quickly to seize opportunities and address challenges. It’s important to emphasize our use of the term program; success with CRM requires much more than just purchasing a CRM application and installing it. The heart of a CRM program is the continual examination and evolution of your customer interactions in order to provide better customer experiences and help your organization achieve its customer-related goals. The CRM application itself is simply the tool used to deliver great customer experiences, streamline your customer-facing operations, and gain insight into your customers and business. Success with a CRM program is built on four pillars: having the right people in the organization engaged in the right roles in the CRM program, implementing well-designed internal and customer-facing processes, implementing the right supporting technology, and setting reasonable expectations for what success looks like and what kind of effort and cost are required to achieve it. Let’s consider each component in turn. Your CRM program will require a number of people from different parts of the organization playing different roles. Job titles and requirements will depend on the organization, but for most organizations, the following roles should be assigned for a successful CRM implementation. Securing necessary funding for the CRM program. Guiding the ongoing CRM roadmap development process to ensure that the roadmap is well aligned with the organization’s strategic goals. Ensuring engagement at the executive level from the different groups within the organization that need to contribute to the CRM program. Setting goals for the CRM program and holding individuals and teams accountable. Being the ultimate decision maker for CRM questions within the organization. Must be a CRM “believer.” His or her tone, engagement level, and enthusiasm all have an outsized influence on the CRM program. Should be experienced with the people and processes in the customer-facing part of the organization. A finance or IT executive is not the ideal person for this role. Employees follow their leaders; the executive sponsor’s frequent, vocal, enthusiastic focus on CRM will communicate to the entire organization that CRM is part of its “DNA” and that each employee needs to make sure it is given priority. In addition to this evangelism, executives also need to hold each layer of management accountable for the success of CRM in their departments. The steering committee is the critical body for guiding the CRM program within your organization. It should be chaired by your executive sponsor and include representatives from all the key CRM constituent groups (for example, inside sales, field sales, customer service, and marketing) as well as from IT and from the CRM administration team (described in a moment). The committee should meet regularly; your situation will dictate the appropriate frequency. Managing the ongoing change control process for production CRM applications. This is the formal evaluation and approval process for configuration changes to the CRM application, used once CRM is in production to ensure that proposed changes do not interfere with any group’s usage of CRM and that they are aligned with the overall CRM roadmap and to communicate these changes to the various CRM constituencies. Developing and maintaining the CRM roadmap for the organization. The roadmap describes the plan for enhancing the CRM program over time and how these enhancements support the organization’s strategic goals. The roadmap may describe new capabilities to be added to CRM, new user groups to be migrated to the application, or new business processes to be implemented and supported with CRM. Planning budget requirements for CRM, based on the roadmap. They can accurately represent the needs of their constituency to the steering committee. They can understand how changes to the CRM program raised in the steering committee will impact their constituency. They can dedicate the time needed to participate fully in the activities of the committee. The IT representative can help in form the committee of planned IT initiatives that may impact the CRM program, as well as coordinate the support provided by the IT organization for the CRM application. This role is less critical for software-as-a-service applications, because the IT department’s responsibility for these applications is typically small or nonexistent, and it is more critical for on-premises CRM applications. The CRM administration team manages the execution of the CRM roadmap, the enhancement of the CRM application, and the training and support of users. They are typically the application experts and can help identify how the application can be used to help achieve a business goal identified by the steering committee. The composition of the implementation team, charged with the initial rollout of your CRM program, will vary according to the complexity of your organization and the initial implementation project. In this section, we’ll describe the key roles on the implementation team; in many cases, a single individual may play multiple roles. The role of the sponsor was described earlier, and as for the overall CRM program, this person is also responsible for the success of the initial implementation. Typically the sponsor will want to stay current on the status and progress of the project and assist the implementation team by clearing bureaucratic obstacles and encouraging engagement across the company to help support the success of the implementation. The initial CRM implementation is a complex undertaking, requiring input from numerous departments and potentially changing behaviors and processes for all of the organization’s customer-facing employees. A dedicated project manager is key to plan the project, keep it on schedule, and maintain communication throughout. The subject-matter experts (SMEs) are the individuals on the team with a deep understanding of the business areas that will be impacted by CRM and will help guide the process design and CRM application design to meet the project goals. For a sales-focused project, for example, the SME team might include the director of sales, an experienced field sales representative, and an experienced inside-sales representative. It is important that the SMEs understand the situation “on the ground” today (what the current processes and what tools are being used) as well as the larger picture – the longer-term organization vision for CRM in their area, and the immediate project goals that help achieve the vision. Some organizations have a tendency to want to leave the individual user/contributor (for example, the salesperson in the earlier example) out of the process, either because of fears of losing their productivity by taking their time with the project or because of fears that they can’t think “big picture” enough to contribute. In our experience, this is a serious risk. Oftentimes, especially in larger organizations, executives do not have a sufficient grasp of how things actually work at the lower levels of the organization, where customer interactions actually occur. If they provide the only voice to inform the process and application design, you may end up with a gap between today’s process and tools and the new CRM solution that is too broad to be bridged. a new CRM application, a set of modifications to an existing CRM application, new application integrations to streamline operations, or new reporting and analytics tools. For this reason, it’s important to include the IT department on the project team. Their responsibility on the project may be to procure and maintain server hardware, update client machines, assist the consulting team with network and server access, and potentially do some development and testing work. For on-premises deployments, the IT organization will also be responsible for disaster recovery planning and application backup. A significant component of the initial CRM implementation project is user training. Trainers on the project team need to communicate to users how their work processes are changing as part of the project and how the new technology tools should be used to support these new processes. Some organizations have dedicated training departments, and others pull their trainers from the departments being trained; often the SMEs on the implementation team end up playing the role of trainer for their groups. “Champions” are the point people within each group of employees impacted by CRM. Typically they have received additional training and potentially been involved in the design process and are charged with helping drive the success and adoption of the CRM processes and tools in their groups. Champions act as first-line user support for the CRM application and for the CRM-related process and as the eyes and ears of the CRM implementation team postlaunch to spot friction points and issues. They also have a key role to play in “evangelizing” the new processes and tools. If you have engaged a consulting partner to assist you, their project lead and project consultants will have key roles to play during the implementation. Typically the partner project lead and your organization’s project manager will work hand in hand to manage the project. The champions, described briefly earlier, are a set of individuals working within the groups of the organization involved in customer processes who act as an ongoing conduit between the group and the CRM steering committee and CRM administration teams. Be vocal supporters of CRM; for this reason, it is useful to select people who are perceived as leaders in their departments Champions act as the CRM program’s “eyes and ears” within their department. They see how the application is actually used in practice by customer-facing employees and therefore what is working well and what is not working well. They are a great source of process and application improvement ideas and can alert the larger CRM team when plans are being made based on faulty assumptions of how processes work. They also play an important role in preparing their departments for process and application changes. Providing end-user support for the CRM application. Sometimes there is a centralized help desk within the IT department that may provide basic, “tier-one” support, but even in these situations, the CRM administration team has a support role to play as an escalation point for more complex issues. There may also be regular tasks that are more complex and that users require assistance with, such as data loads, mass e-mails, and complex queries. Maintaining the health of the CRM application. Again, depending on the structure of your IT organization, some tasks may be handled outside the CRM administration team, but they include applying software updates to the CRM application and the underlying operating system and database software, ensuring that the application is being backed up regularly both on-site and off-site, and preparing and practicing for disaster recovery. These tasks are not needed if you are using a software-as-a-service application. Administering users within the CRM application, including creating accounts for new employees, deactivating departing employees, and adjusting security access as employees move between groups or change roles. The second mission is to identify, plan, and implement enhancements to the CRM processes and application. 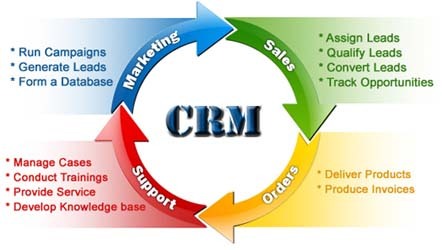 The CRM roadmap is the phased plan for the development of the CRM program, which is always evolving. These enhancements can range from relatively minor in scope (adding fields to an object in the CRM application or automating an e-mail communication to smooth a transition from one team to another in a process) or significant such as bringing a new department into the CRM program. Some of the following roles may be held by members of the IT department. If not, especially if your CRM application is hosted by your own company, there should be some representation from the IT department on the CRM administration team, even if it is simply as “virtual” team members who are kept in the loop about the work of the CRM administration team. The role of the CRM business analyst is to combine three strands of understanding to help define a future state in which the organization is more effective and achieving its business goals. The first understanding is how employees work today, the second is what the organization’s CRM goals are, and the third is a deep understanding of how the CRM application can be configured and customized. Combining these, the business analyst can outline how a given work process and the supporting CRM application can be modified to make the organization more successful. Experience with process design/re engineering. Experience with requirements gathering for technology systems. Experience developing functional specifications for software applications. Deep understanding of and experience with your chosen CRM application. Deep understanding of the business processes supported by your CRM Administrator. The CRM administrator is the central figure in maintaining and modifying the CRM application and, with the exception of the CRM developer described next, is typically the most technical member of the CRM administration team. This individual handles user support issues, maintains the application health, handles user management, and makes configuration changes as needed. In addition, this person typically manages data imports and the installation of any product add-ons. Most CRM applications can be modified in limited ways via a set of configuration tools that do not require deep technical skills. However, in most cases, implementing custom business logic to support your organization’s specific business processes, building integrations to other applications, or developing highly customized reports all require programming. For this reason, organizations with significant complexity should consider having a software developer on the CRM administration team. The specific skills and experience needed will be determined by your organization’s choice of CRM application. Training is an ongoing process within your CRM program. New employees join the organization, and enhancements to both CRM processes and applications necessitate ongoing training for existing employees. Typically this training is handled within the department, often by the departmental champions described earlier. However, larger organizations may include a trainer as part of the CRM administration team. These dedicated trainers collaborate with the departmental champions to develop training materials and curriculum. Significant application or process changes may also require the CRM administration team to step in and provide training to employees rather than have training handled within the department. ← What Does CRM to CMS Integration Really Mean?